Many insolvency industry gray beards who live in states where agriculture is a major industry will remember the 1980s farm crisis. That’s when agriculture loan default rates exceeded 6 percent, many family farms were lost forever to foreclosure, Farm Aid Concerts were held to help financially strapped family farmers, and Congress enacted Chapter 12 of the U.S. Bankruptcy Code to give smaller family farmers special protections to help save their farms. This article explains why the author believes the U.S. is on course for a likely repeat of the 1980s farm crisis. U.S. crop farmers, dairy farmers, and livestock breeders have faced a secular decline in income since the peak of 2013, and many farmers have been operating at approximately cash flow breakeven before debt service levels for nearly five years due to an extended period of low commodity prices. “Debt-light” farmers are working for virtually no profit, but most are surviving. However, “debt-heavy” farmers who depend on their lenders to fund annual crop planting inputs or regular livestock inputs to produce their commodity likely are not generating enough positive cash flow to pay their full debt service. Of special note is that their situation has worsened as the Federal Reserve gradually increased interest rates over the past few years. 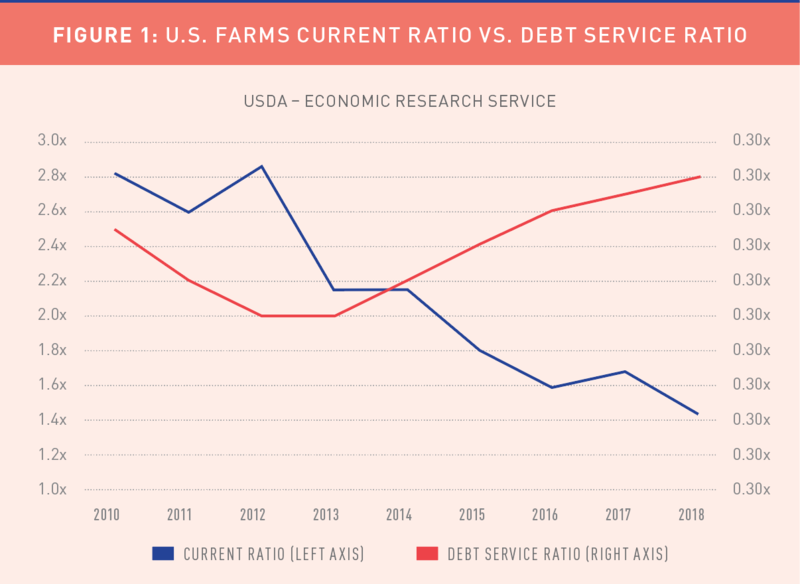 Figures 1 and 2 show the adverse trend lines for debt service and net farm income for U.S. farms. Farmers who own land have been relatively fortunate, as farmland values have remained generally stable the past four years. That stability is the one bright spot in the agriculture sector, because traditionally when crop prices fall, farmland values drop in lockstep. That hasn’t been the case in this commodity cycle. When larger tracts of land have been put on the market, they have been eagerly acquired by large farmland owners, corporate farming operations, or yield-hungry Wall Street hedge and investment funds. The apparent rationale for farmland holding its value to this point is fourfold. 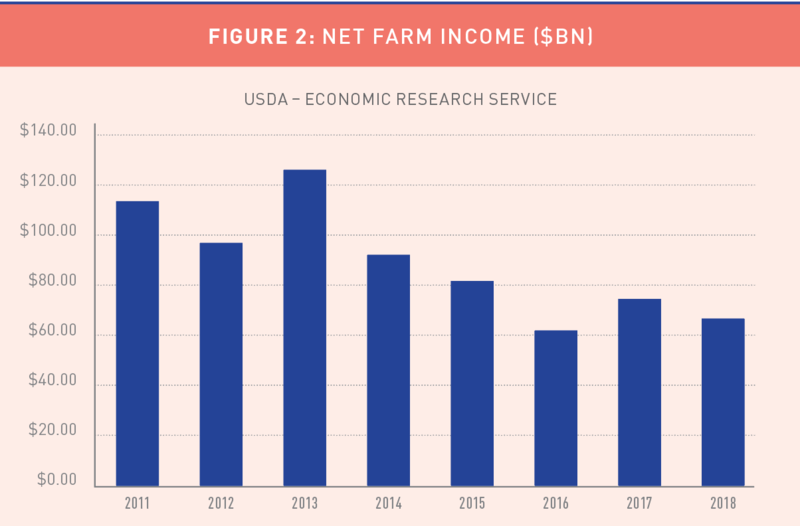 First, there is a relatively fixed supply of U.S. farmland, and the global demand for food, particularly protein and organic-based products, will continue to rise. Second, advances in technology and equipment that have increased the efficiency of farming are more easily affordable for larger enterprises, increasing the disadvantage faced by small and medium-size farms. Third, the U.S. maintains a competitive advantage over many other countries in the export of commodity food products due to its significant transportation and logistics infrastructure. Finally, many believe that other countries will need to purchase additional U.S. agricultural products in the future to balance out trade flows with the U.S. For all of these reasons, the value of U.S. farmland is expected to rise in the long term. U.S. commodity prices historically have been cyclical, so nearly everyone in the agriculture industry expects farm commodity prices to increase eventually. However, the big question is when will that happen? Signals for a pricing recovery in the near term are absent, given that global economic growth slowed in late 2018 and into early 2019 and the simmering protectionist trade wars between the U.S. and its major farming trade partners. But new trade agreements can be reached quickly. Current news reports suggest that a U.S.-China trade deal that would require China to purchase significant amounts of agricultural products from the U.S. going forward would be announced at the end of March 2019. However, from a macroeconomic point of view, a true market correction may be underway that will permanently reduce U.S. farm capacity. The first victim of such a reduction would likely be the less cost-efficient family farmers. In essence, small family farmers are being run out of business by low farm commodity pricing and a lack of capital to invest in harvesting and processing equipment and technology. Family farmers are much like small retailers that faced significant price and cost advantage pressures from big-box merchants and online retailers. Essentially all farm commodities have become globalized, meaning that the “landed” prices of farm commodities are set in a global market. “Landed” means that the market price in a given country takes into account the sales price, logistics costs, and duties. This is both good and bad news for U.S. farmers. The good news is that increased international demand for products has helped push up prices and absorbed some of the U.S. supply of farm commodities. The bad news is that other nations with large agricultural supply capacity, such as Russia and Brazil, now compete with U.S. farmers to satisfy that same international commodity demand, which pushes prices down. Of course, trade relationships with major farming trading partners—for example, free trade or the opposite, characterized by trade barriers such as tariffs—and relative exchange rates also affect relative pricing and demand. As a result, there is currently a glut of many farm commodities in the global marketplace, which has led to increasing farm trade tensions with the U.S.’s major trading partners amid a slowing global economy. The inescapable conclusion is that farm commodity prices are unlikely to increase in the near future. But the era of “free money” has ended. Interest rates have increased by more than 200 basis points over the past two years, and all assets except farmland have depreciated in value. Thus, some farmers greatly expanded their operations at the height of the commodity price run using borrowed funds at minimal interest cost from lenders that were all too willing to assist because they were eager for loan portfolio growth. Now that farm commodity prices have dropped and stayed low for five years and interest rates have increased and will likely rise even more, small and medium-size farmers that expanded are under significant financial distress or soon will be. The final factor contributing to the pending farm crisis is farmland values. If larger farms that control significant farm acreage start to fail, putting a significant amount of farm acreage on the market, land values likely will come under pressure, causing collateral values for agriculture loans to plummet. Many loans will become worth less than their underlying collateral. A final point is that over the long term, the true economic value of farmland has to be dependent on the value of the crops or livestock the land produces. Farmland only has economic value relative to the production of a commodity. So, what should a family farmer who’s being squeezed by low commodity prices and increasing interest rates do? First, a family farmer must decide whether he wants to fight to keep all or some portion of the family farm. This is not a theoretical question but a practical one, because the next few years will almost certainly be tough financially and emotionally for the family farmer. Assess financial viability immediately. Assuming current commodity pricing, input costs, and average yields, does the farm generate positive cash flow before debt service? 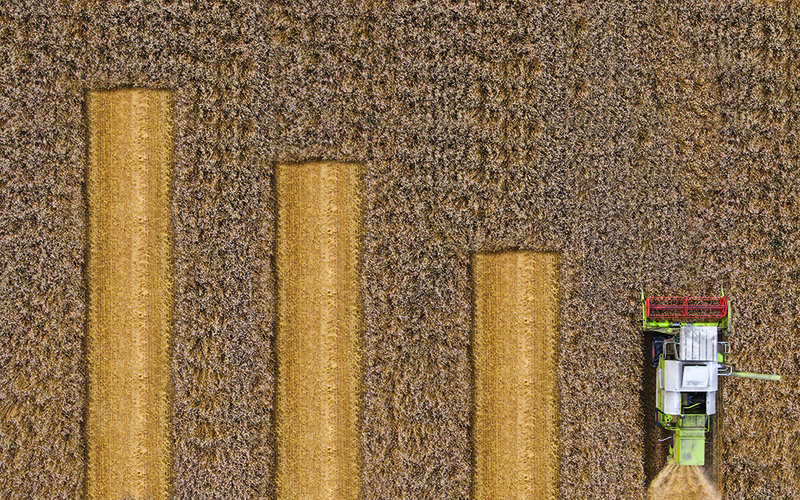 Gauge opportunities to downsize and create a profitable farm. Is downsizing the operation an option, focusing on only the best components and surrendering back to the lender those assets that aren’t truly needed? If so, does the farm generate positive cash flow? Create a cash reserve. Sell all luxury items to generate cash to live on because it’s unlikely the farm will provide much spendable income over the upcoming few years. Try to get farm debts—the bank, suppliers, and delinquent leases—under the $4.2 million Chapter 12 threshold for eligibility. Determine one’s willingness to pledge as collateral (put at risk) personal assets to keep the family farm. Evaluate whether some family members should get outside jobs to supplement the family’s income. Consider filing Chapter 12 if eligible. Although bankruptcy isn’t a pleasant experience, it represents a valuable and practical tool that allows a family farmer to pay creditors over time and to survive quite a few more years of low farm commodity prices. Each class of creditors is treated differently in a Chapter 12 bankruptcy. This process provides for a three- to five-year horizon to pay back “priority” creditors in full. Secured creditors are entitled to payments that are equal to the market value of their collateral over the useful life of a specific category of assets. Lastly, unsecured creditors are allocated the remaining portion of farm disposable income over the same three- to five-year time period. The author believes smaller family farmers will be filing Chapter 12s at an accelerating rate going forward. 2018’s year-over-year filings were up 60 percent to more than 100 percent, depending on the geographic area of the country. Family farmers who don’t elect to pursue a Chapter 12 filing will almost surely face significant pressures, and many will have no choice but to liquidate their farms. However, larger and corporate farmers and processors who obviously have more than $4.2 million in debt and therefore aren’t eligible to file Chapter 12 are not filing Chapter 11s—yet—for two reasons. First, the majority of the larger agriculture loans are held by Farm Credit System lenders and local community banks, which historically have been more patient with troubled agriculture borrowers than large commercial banks. Secondly, much like the oil and gas lenders who seem to have decided as a group to stick together and hang on to many troubled credits when oil prices plummeted to $30 a barrel and stayed there for several years, big agricultural lenders appear to be sitting tight for now. These lenders understand that as soon as one large lender becomes aggressive with larger borrowers, causing assets to be sold at “fire sale” prices, prices for agriculture assets likely will decline significantly across the board, financially devastating both borrowers and lenders. The author predicts that distress on these agriculture credits will start in earnest in 2020, which will result in a significant increase of the number of large debt restructuring cases. Farmland prices will also start to adjust downward in 2020 as larger scale tracts of land come on the market due to borrowers’ distress coupled with lenders and bank regulators that can no longer ignore growing portfolio problems. When the price of farmland starts to fall, insolvencies in the agriculture industry will be booming. Daniel F. Dooley, CTP is principal and CEO at MorrisAnderson and has served as CRO, CEO, COO, and CFO for publicly and privately owned companies nationwide. He is a past TMA Global board member and vice president, and a past president of the TMA Chicago Chapter. He holds a bachelor’s degree and an MBA from the University of Minnesota’s Carlson School of Management.